STATESVILLE, N.C. (Jan. 22, 2019) – Race-winning crew chief, Phil Gould will join Niece Motorsports in 2019, serving as the crew chief for the No. 45 TrüNorth™ Chevrolet Silverado driven by Ross Chastain and Reid Wilson during the 2019 NASCAR Gander Outdoors Truck Series (NGOTS) season. Gould was most recently with Roush Fenway Racing, as crew chief for Ryan Reed in the NASCAR XFINITY Series (NXS). In three seasons together, the pair made the Playoffs each year and earned a victory at Daytona International Speedway in 2017. Prior to joining Niece Motorsports, Gould served as crew chief for Elliott Sadler while at Roush Fenway, and Brian Scott while at Richard Childress Racing. Gould entered the NASCAR scene when he moved to North Carolina in 2000, spending his first year in motorsports as a mechanic in the NXS with driver Mike Stefanik. In 2001, Gould moved to Evernham Motorsports, working on Bill Elliott’s No. 9 team as a mechanic and rear tire carrier. Gould helped secure victories with the No. 9 team at Homestead-Miami Speedway in 2001 and in the Brickyard 400 in 2002. Gould joined Richard Childress Racing in 2003 as a mechanic on the No. 21 NXS Chevrolet. He was a valued asset as the team captured the NXS Owner’s title with Kevin Harvick and Johnny Sauter. In 2004, Gould became the car chief of the No. 2 NXS Chevrolet at RCR with Ron Hornaday and then with Clint Bowyer in 2005. Starting in 2006, Gould served as the car chief of the No. 07 Monster Energy NASCAR Cup Series (MENCS) Chevrolet at RCR working with Clint Bowyer and Casey Mears. Midway through the 2009 season, Gould transferred over to a new role as the car chief of the No. 29 MENCS Chevrolet with Kevin Harvick. Gould was a part of the team that earned back-to-back third-place finishes in the Chase for the MENCS Cup in 2010 and 2011. Last season, Chastain made three starts with Niece Motorsports, at Bristol Motor Speedway, Texas Motor Speedway and Homestead-Miami Speedway, earning a best finish of 12th at Bristol Motor Speedway. In September, Chastain broke into the Winner’s Circle in the NXS, after putting on a dominating performance at Las Vegas Motor Speedway, winning each stage of the race and leading 180 of 200 laps. Wilson, who will split the No. 45 ride with Chastain, competed in three NGOTS events in 2018; at Martinsville Speedway, Iowa Speedway, and Homestead-Miami Speedway, with Wilson’s best finish of 16th coming at Martinsville Speedway. Prior to moving into the NGOTS, Wilson competed in the NASCAR K&N Pro Series East, where he had a 50 percent top-10 rate. In 2018, he was named No. 46 in MotorsportsAnalytics.com’s ranking of the top 75 NASCAR Cup Series prospects. “Reid hasn’t competed regularly in a NASCAR ladder division, but when he does appear, he’s proven formidable,” stated David Smith, president of Motorsports Analytics. The NASCAR Gander Outdoors Truck Series season will kick off at Daytona International Speedway on Friday, February 15, 2019. Niece Motorsports is owned by United States Marine Corps Veteran Al Niece. 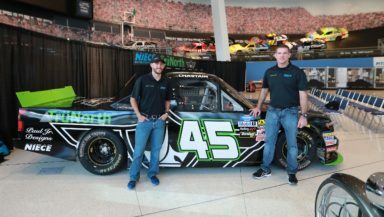 In 2019, Niece Motorsports enters its fourth season in the NASCAR Gander Outdoors Truck Series, with drivers Ross Chastain and Reid Wilson. Niece also owns Niece Equipment, which has for over 40 years provided clients with reliable products at competitive prices. Niece Equipment’s reputation is built on service, integrity and dependability. The company provides water and fuel / lube trucks that are engineered with quality and durability in mind for the construction and mining industry. Follow the team on Facebook and Instagram @NieceMotorsports as well as Twitter @NieceMotorsport.